Colin Jewall has been a master photographer for the past 25 years. Prior to becoming a professional photographer, Colin spent 14 years in a design-oriented career. He practiced residential, commercial, and industrial architecture. Working with engineering firms, he designed mining processes, combustion processes for pulp and paper mills, and even designed truck chassis for Canadian Kenworth. His love of photography led him into the study of photography from several institutions and from photography master classes. He studied lighting extensively, and mastered techniques that are not taught � much from his own investigation and observation of natural light. In 1983, he formed his own photography company, and operated a major photography studio in Vancouver with a staff of eleven. One of Colin�s main assistants was a key assistant to Yousuf Karsh, one of the most famous and accomplished portrait photographers of all time. As well as being chief administrator, Colin was also a mentor to his employees. In his 2,200-square-foot studio, Colin and his dedicated team photographed a diverse mix of objects, from items as small as jewelry to architectural models to full-room sets. His location photography assignments included architectural, industrial, and aerial shoots. Colin learned early in his career the importance of mastering photography in all fields. He even had his own film- and print-processing lab at the Pan Pacific Hotel in downtown Vancouver. At Expo �86, Colin and his company were the official photographers for the Canadian and British Pavilions. Colin was personally chosen to photograph Prince Charles and Princess Diana, former British Prime Minister Margaret Thatcher, and former U.S. President Bill Clinton during their visits. With his expertise and attention to detail, Colin thrives on the challenges of a technically complex shoot. B.C. Transit once hired him to do a shoot in Vancouver that required the rental of the downtown length of Hornby Street for six hours with 60 people on the set, all shot on 4� x 5� black and white film. 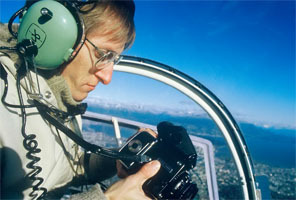 He has photographed trains at treetop level from a helicopter while flying 80 kph sideways, and even photographed the British Airways Concorde jet in flight. On assignment in Las Vegas, a Hollywood movie studio hired Colin to shoot the city�s skylines from casino rooftops for movie sets. During a week-long assignment in northern B.C., Colin and his crew of seven worked from two Bell Jet Ranger helicopters photographing the region�s spectacular scenery. An accomplished classical guitarist, Colin travels the world photographing some of the best musicians and composers of this century. Colin and his wife moved to Kelowna in 2003 for a change in lifestyle. His new hometown has learned of his photographic talents, especially his exceptional architectural photography. Not only does Colin photograph the most luxurious residences in the Okanagan Valley and on the West Coast, but clients throughout Canada, the USA, Mexico, and Europe continue to call upon his services.